Given the choice I'd live in a completely minimalist house looking out onto the ocean, flat roofs, lots of glass, clear surfaces and clean lines. I'm not a great one for clutter, I like plain white crockery, white linen, sometimes I turn a bit queasy when I go into a Cath Kidston shop, but I have been charmed by a couple of older items lately. Firstly I found this lovely old knitting pamphlet (I like that word) in a charity shop for 50p. It has some strange patterns for knitted ladies knickers B in the above photo, men's underpants both half and full length that decency prevents me from showing, a little bed jacket (C) that I quite fancy as a summer cardigan, great sock patterns, including footlets (G) and knee caps (H) and some sweet baby clothes. The book has been well used, it's practically falling to pieces but I like the fact it has served it's purpose and survived for a long time, probably from around 1950. Next my second cousin, after some heavy hints, has given me this lovely old patchwork quilt that belonged to her cousin's mother and it possibly about 80 years old. You may know I have aspirations to make a patchwork, I did get started about 3 years ago but never got very far. My cousin didn't seem to think it had any great value because it had some marks, she even suggested cutting off the border that is slightly faded. Perish the thought, I've given it a gentle wash and the colours have come up well, it really doesn't bother me that it's marked, that is to be expected of something so old and a sign of good use. I love the different shapes, squares, hexagons, oblongs, triangles, and I think the colours and mix of patterns are well thought out. It's currently on the old cast iron bed that was my grans and which Mr FF renovated with a new base and mattress some years ago. Neither of these items fits my minimalist image, but I do like them and until I move into the glass and chrome structure I am enjoying having them around. The other morning I answered the home phone to a recorded message allegedly from my credit card company saying that there had been unauthorised use of my card and I needed to press 2 to be put through to the fraud department. I assumed it was a scam as I often get calls saying that there is a virus on my computer, that I should log on and follow some instructions to get rid of it, yeah right. (The last time we got one of these virus scam calls we asked the caller if he could give us a 12 digit log on code and answer some security questions, he hung up shortly after that.) While I was wondering what to do the next part of recorded message said it was urgent that I call them on an 0845 number. I put the phone down and checked the contact numbers for the company on their website, they were all 0885. Later I mentioned this to Mr FF who said he'd had a similar recorded call ages ago to verify a genuine overseas use of his card and that it probably was OK. 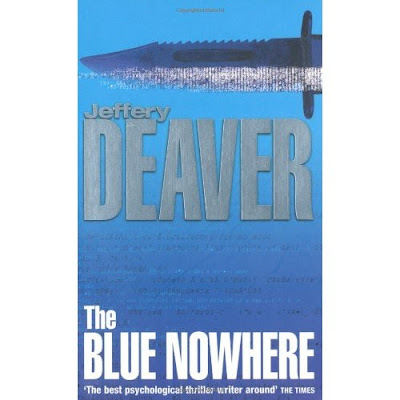 If I hadn't that same morning finished this book I might not have been so suspicious but having read this fast paced insight into the world of hackers who infiltrate police and government computers and use social engineering to commit murder, a book full of bluff and double bluff, I might not have been so concerned. The phone rang again later and this time Mr FF answered, went through the button pushing process and eventually got a real person, who he passed to me. This person listed the last 5 transactions on my card, two for about £1,000, one for £450 and 2 for less than £20. The last 2 were mine (obviously) and had been accepted, the others which had fortunately been declined by the credit card company were definitely not mine. The call centre person offered to cancel my card and send me a new one within 5 working days but again I wasn't sure if this was genuine so I said I'd prefer to call the credit company rather than act on a call that I couldn't verify. He was pleasant enough and suggested I ring the customer care number on the back of my card. So I made my own call, got through to the fraud department again, went through some security questions was given exactly the same information and again the offer of cancelling my existing card immediately and waiting for a new one, which this time I agreed to. Bad enough that some scum has used my credit card details, the attempted purchases were for a UK mail order fashion company, a UK printing company and some organisation in India, but even worse that I felt I couldn't trust the person who phoned to help me. I really don't want to feel that they are all out to get me, it was a good book though. We had lots of fun with my brother and sister in law, though it was the first time they had visited Italy and the first time abroad for my brother, they completely launched themselves into the experience and were enthusiastic about everything. We did the tourist trip to Rome on the train, went to the beach, walked round local towns, ate out in the village and visited friends. One morning I'd been up a while and around 8 am asked at their bedroom door if they were awake thinking to take them a cup of tea. When there was no reply I imagined our trip to Rome had exhausted them so I was very surprised when the turned up at the back door at around 9 am looking slightly hot. They'd got up at 6 and taken a walk down to the village and then up the mountainside to the little chapel that sits just below the summit. They'd spent a long time looking up at the chapel from our terrace, decided they just had to go and had a wonderful walk. After they left of course we were into the decorating, Mr FF had the new wallpaper steamer in action straight away. It was very satisfying to peel off great sheets of the old paper but as expected the wall underneath wasn't good so we had the whole room replastered with a rough texture to which we applied two coats of white paint I'm don't know whether I like it or not, all the open plan downstairs of the house is a very rough white painted plaster that looks perfect but in a little bedroom I'm not convinced. It didn't help that we only finished the room at 9 pm on the Sunday, leaving less than 12 hours to clean the house (which was extremely dusty), eat, pack, sleep, close up and drive to Rome for our flight. I didn't really get chance to dress the room and the beds weren't made up so I'll add the finishing touches next time we go out and then decide. This was another major improvement to the property and pleasing as it was to get this done, it's the little things around the house that really make me happy. Hanging my solar lantern in the garden, it works so well with all that sun. Picking a few wild flowers and herbs from the roadside using a little drinks bottle as a vase. You can see the texture of the downstairs wall here. Seeing that one of the shrubs I've been carefully pruning and tending these last few years is finally flowering well. Having a garden bonfire, these are banned in high summer so it was good to get rid of some debris now. I am so easily pleased and I am always pleased to be in Italy, roll on the next visit. We've been home from Italy since Monday after much fun and much work, strangely today I feel completely exhausted. 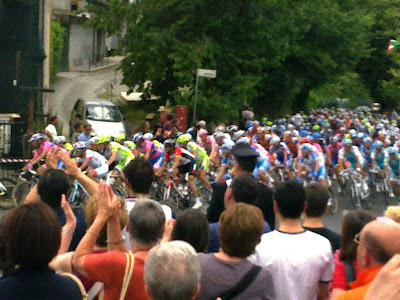 Mr FF has gone off for meetings and I don't plan to do much except catch up with the latest stage of the Giro d'Italia. I'd been really looking forward to seeing the race come through our little village and following events on Italian television so I was devastated when a young rider, Wouter Weylandt, only 26 was killed on a fast descent on the third day of the race. The following day the riders did not race, the whole field rode the route in respectful silence with spectators applauding solemnly or holding up tributes to Wouter, his race number was constantly on display. Teams rode together taking turns to lead until the team mates of fallen rider went to the front and crossed the finishing line first with their arms round each other, many in tears. The next day the team withdrew from the race as did the best friend of the lost rider leaving me to ponder what huge risks these boys take for their sport. 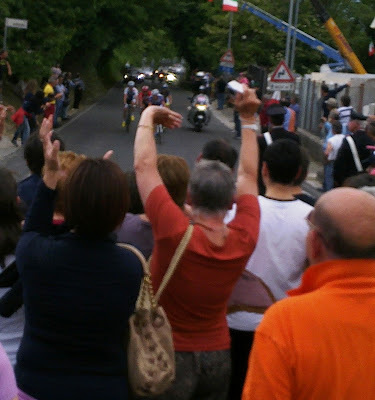 Our house is up on the mountainside, so we had to drive down to the lower more modern part where the giro was coming through towards the end of the days racing. Our village had done a great job of welcoming the giro and no one was allowed to stand in front of the police car even our local stone merchant, the Marmi Man as we call him, had put up banners and flags. First we had a breakaway of five riders (I am the over excited woman in the orange t shirt) and shortly after the rest of the field came through tightly packed together, it was like a colourful river of lycra sweeping round the corner, so beautiful. Mr FF then said that we probably had time to drive to the end of the stage and catch them again. We found the perfect position just past the finish line, seeing the stage winner Francisco Ventoso as he slowed down over the line, the maglia rosa, the overall race leader, and the rest of the field who not only rode past us fairly slowly but then turned round and came back as they cooled down. Mr FF says I was delirious with delight, we saw the live television broadcast stand and the presentations on the podium, a perfect afternoon for this giro groupie and our best viewings ever. Yesterday back home I watched the stage in English which makes life much easier and was delighted to see British sprinter Mark Cavendish take the stage. I'll tell you about the fun we had with my brother and sister in law and the hard work we had decorating another day, as I said I am really feeling tired today, knitting, telly and coffee are needed.